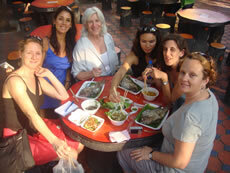 Mar 2009: What could be more fun than travelling with five of the Tante Marie teachers to Thailand to learn about the regional food? We met up at the fabulous Oriental Hotel in Bangkok and had a day or two to recover from the long flights and check out the local markets, palaces, and Jim Thompson's house. Frankly, having breakfast on the terrace overlooking the river and meeting other travelers from around the world is my idea of heaven. Everyone was just so happy to be there. Then we flew to Chiang Mai. The goal of our trip was to immerse ourselves in the cooking of northern Thailand under the influence of Naomi Duguid and Jeffrey Alford, the renowned cookbook authors from Toronto. 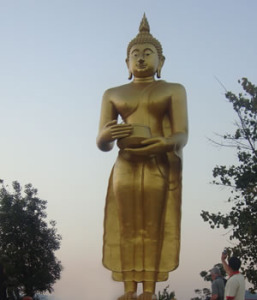 Their idea was to introduce us to the cooking of northern Thailand by having their friend Fern, her mother, and her farm workers show us their native cuisine at their apartment in Chaing Mai and at Fern’s farm about three hours north, near the border of Burma. 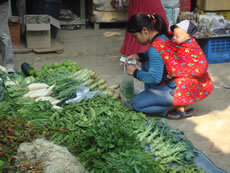 Each morning we would go to the markets in teams, returning to their apartment or the farm with fresh ingredients. 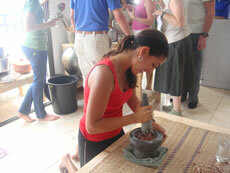 Then, most everyone would pound and chop and cook the various dishes. (I usually hung out with Jeffrey drinking local beer with ice or a kind of local rum with soda and lime.) Around two in the afternoon we would sit for a buffet-type meal of very regional food. We had a blast! Here is what we learned: In northern Thailand people generally like to snack all day, mostly on food bought in the streets. It is common to have a noodle dish for lunch; the base for the evening meal is sticky rice eaten with maybe three or four savory dishes; and desserts are never served after a meal, except perhaps fruit. The food is simplistic and always served with a platter of fresh vegetables and herbs. Generally, it is up to the eater to bring the food up to the taste they desire with condiments, and I think the eater cuts the heat of the food by eating the accompanying fresh vegetables—not to mention how healthful it is. It appears that they cook with what they have, and nothing is wasted. We cooked with such ingredients as live frogs, chicken and beef blood, banana flowers, fresh bamboo shoots, ant larvae, a red vegetable that tasted like rhubarb, morning glories, and jack fruit, and more! 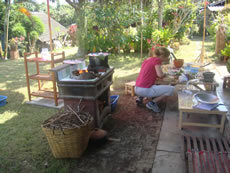 For so many of the dishes, the cook starts out the same, which is to pound the galangal (a type of fresh ginger) with garlic and/or shallots, lemongrass, and dried or fresh chilies and other spices. This is pounded in a mortar and pestle until very fine and then cooked in a little oil in a wok on top of a charcoal (or wood) fire. When the spice mixture begins to color and smell aromatic, the chopped meat (or chicken) is put in to cook. Then, liquid is added and the mixture continues to cook. The dish is then finished with some fruit or greens cooked for a shorter amount of time. Everything is served at the same time with the sticky rice and fresh vegetables and herbs. We were taught to eat with our hands by making a ball of rice, then reaching for the common plate for say, chicken. What the eater does is eats the rice and chicken and thinks about the taste before going on to the next dish. Or, the Thai’s may eat by pushing the food onto a spoon with a fork. Chopsticks are only used for noodle dishes. All the food was really good! I especially liked the fried peanuts with lime leaves we had with drinks the first night. 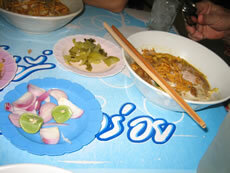 We ate an amazing Khao Soi for lunch one day. 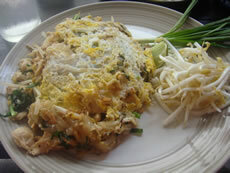 It is a noodle dish with coconut milk which is used mostly in southern Thailand. 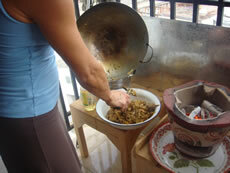 You will find a recipe for Khao Soi on Jodi Liano’s blog mmmthatsgood.blogspot.com. For another lunch we had a Pad Thai that was extraordinary—also a noodle dish with sprouts and covered with an herbed egg. You can find that recipe on Farina’s website farinakingsley.com. 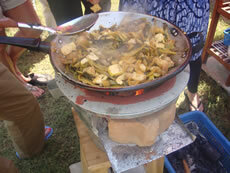 My favorites, however, were the Spiced Pork served with Sticky Rice and Morning Glories Cooked with Pork Rinds. Here for you is my menu for an easy Thai party menu—don’t forget the beer and rum! 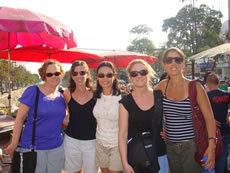 Thank you Farina, Jodi, Jen, Margaret, and Penelope for a fabulous cooking week in Chiang Mai! Thank you too Naomi and Jeffrey for sharing your life in Chiang Mai with us for a week! To learn more go to www.immersethrough.com. A simple Thai menu developed using concepts from our cooking week in Thailand, but ingredients that can be found in most supermarkets. From one easy-to-prepare menu you can make another two meals!